It's a fact of the toy industry that in any multi-series line, you're going to get variations of the main character. Fans just have to accept it. However, there's no rule that says the variations have to be bad. Even the most outlandish costumes can be made to look decent with a little bit of time and attention, but it seems that neither of those are resources that most companies are willing to spend. Mattel is one of the worst offenders. They completely crippled He-Man by turning out nothing but bad rehashes with little regard to aesthetics or appeal, and Batman is hot on his heels. "Croc Hunter" or no, Batman would not wear neon green - he's a creature of the night, and needs to dress as such. Surprisingly, not all the variations are awful. When the costumes are kept simple, things can work. About the farthest you can go from "normal" and still look good can be seen in Series 1's Hydro-Suit Batman. The plain Bat-body, as designed by the Four Horsemen, is the basis for all the figures, so you at least know what you're getting - a decent sculpt that moves at the neck, shoulders, gloves, waist, hips and knees. The costume is then built around that. 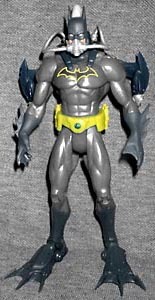 Hydro-Suit Batman, for instance, has flippers, webbed fingers on his gloves and a new utility belt. 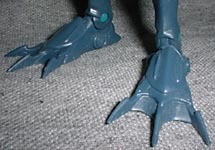 He also gets the addition of ankles, which is more than most Mattel figures have ever rated. 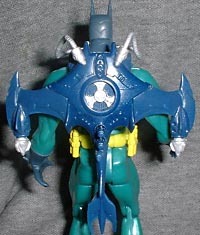 The flippers were originally intended to be removable, but as they have so many times before, Mattel changed things after the Horsemen handed it over. To help propel him through the water, Bats has a vaguely ray-shaped backpack that doubles (triples?) as a missile launcher and scuba tank. A light gray facemask is connected by tubes to the backpack, and it plugs into Bruce's face. Yes, that's right, there's a big hole under his chin so the mask can be held in place. Amazingly, the hole is barely noticeable and doesn't detract from the figure at all. 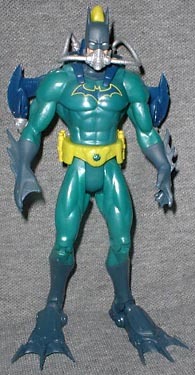 The missile (as well as Batman's utility belt and any other yellow highlights on the figure) is a bright neon yellow, which should look out of place on Batman, but instead fits with the color scheme - the backpack, flippers, gloves and cowl are dark blue, while the body of the suit is a somewhat aqua green. There is a pair of removable canisters on both the left and right side of Bats' belt - probably shark-repellent Batspray. I'm not crazy about the colors - green, blue and yellow just don't say "Batman" to me. Well, okay, the blue is good, but the green could have been much darker and the yellow could have just been omitted. Just darker colors overall would have been nice, because the design is pretty good. Just ask Michael Turner. In issue seven of DC's Superman/Batman comic, Bruce was doing some underwater reconnaissance, and guess what he was wearing - that's right, scuba gear that seems very influenced by this figure. The only difference? Better colors. I realize that bright colors are a sort of manufacturer shorthand designed to help lazy parents: mom and dad might not be bothered to remember the name of all the dozens of toys they've bought, but they can remember that they have the red one and the black one, but not the green one. Still, a lot of these crazy costumes would look a whole heckuva lot better if they were done in blacks and greys. We can't get away from variations, no matter how much we might like to. As far as these things go, Hydro-Suit Batman is a pretty decent figure. The colors aren't entirely awful and the design is actually quite nice. And considering the way these things are clogging shelves, you can probably find him real cheap. At the rate of one villain per series, how long do you think it'll be before we see your favorite? Tell us on our message board, the Loafing Lounge.